I am a meteorologist (BS and MS degrees), was certified as a consulting meteorologist and have worked in the air quality industry for over 40 years. I author two blogs. Environmental staff in any industry have to be pragmatic balancing risks and benefits and (https://pragmaticenvironmentalistofnewyork.blog/) reflects that outlook. The second blog addresses the New York State Reforming the Energy Vision initiative (https://reformingtheenergyvisioninconvenienttruths.wordpress.com). Any of my comments on the web or posts on my blogs are my opinion only. In no way do they reflect the position of any of my past employers or any company I was associated with. On April 18, 2017 the Syracuse Post Standard published a featured editorial by Dr. Cornelius Murphy, Jr. “EPA Chief is wrong on the greenhouse gas effect”. I was given the opportunity to submit a rebuttal but was asked to make it the same length. This presents a problem because of the Baloney Asymmetry Principle, the third of my pragmatic environmentalist principles. In particular, the amount of information necessary to refute BS is an order of magnitude bigger than to produce it. This post rebuts his arguments. Dr. Murphy’s editorial is an example of the straw man fallacy prominent amongst the critics of the current EPA. He describes the science behind the greenhouse effect and claims that Administrator Pruitt disagrees with those facts to support his claim that Pruitt must not be allowed to provide direction and policy for CO2 mitigation. The Catastrophic Anthropogenic Global Warming (CAGW) hypothesis espoused by Dr. Murphy claims that mankind’s emissions of greenhouse gases are responsible for the recent observed warming of the globe and, unless stopped soon, will have catastrophic impacts on the planet. This post addresses the catastrophic component of global warming which, I believe, are not obvious by simply “looking around” as Murphy suggests. Robust scientific theories and hypotheses rely on a combination of both empirical and correlative evidence. In the case of a theory that cannot be directly tested through a controlled experiment, we have to rely on long term observations and comparison of projections based on the theory against the observations. Empirical observations and correlative evidence for the CAGW hypothesis are not as obvious as Murphy implies. I have no issues with Dr. Murphy’s description of the greenhouse effect. The basic greenhouse gas theory is not controversial. Carbon dioxide is a greenhouse gas. It retards radiative cooling. All other factors held equal, increasing the atmospheric concentration of CO2 will lead to a somewhat higher atmospheric temperature. It is not controversial that CO2 has risen in the last century or that at least half of the increase was due to mankind. It is also obvious that average temperatures are increasing over that same period. Dr. Murphy said that Administrator Pruitt “doesn’t think that CO2 is responsible for heating our planet”, but I don’t think Mr. Pruitt would dispute any of the aforementioned facts. However, those facts do not necessarily lead to catastrophe and there is a healthy debate on most policy-relevant aspects of global warming. In the first place, there is a predicted warming due to greenhouse gases when all factors are held equal but all other things are never held equal in meteorology. In that case, doubling the concentration of atmospheric CO2 from its pre-industrial level would reduce outgoing infrared radiation by about 4 watts per meter squared and the temperature of the atmosphere would increase about 1.2 deg. 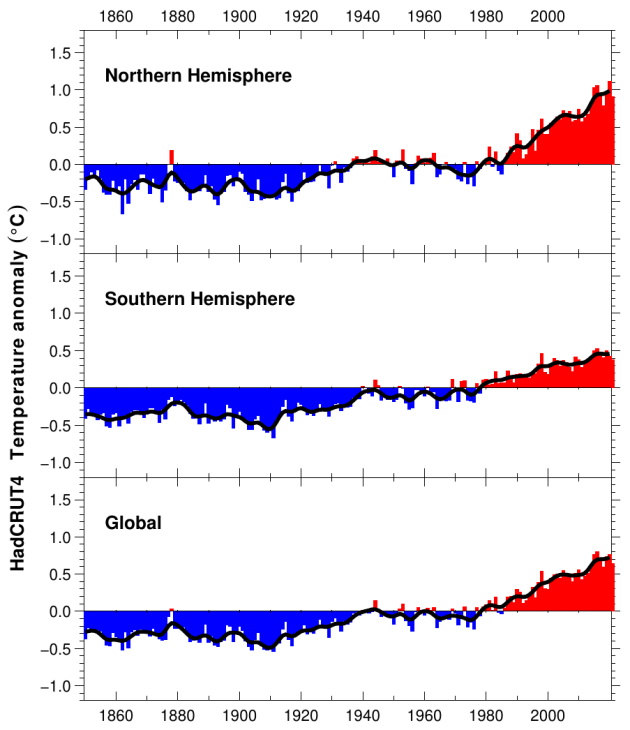 C. Note that about half of this warming has already occurred. So clearly some of the observed warming is caused by this effect. The most recent warming period started before the recent rise in CO2. There have been other warm periods of the same magnitude of the current period in the last two thousand years when anthropogenic CO2 was not the driver. At a minimum the CAGW theory has to explain why the causes of the warming between 1900 and 1940 which is of the same order of magnitude as the current warming are not playing a role now. Dr. Murphy says that Administrator Pruitt should look at what is happening around him and cites several examples: “We have wild extremes in temperatures but annual average global temperatures continuing to rise. The temperatures of our Great Lakes are 6 degrees above average, extreme weather events challenge us all too frequently, and we experience mega droughts globally on a regular basis.” I address those points below. I do not dispute that annual average global temperatures continue to rise. However, to me, if there is a valid concern about rising temperatures, then we should be able to find evidence that heat waves are increasing. The EPA climate change indicators high and low temperatures web page lists several parameters associated with temperature. The heat wave index shows an overwhelming spike in the 1930’s but there is no suggestion of a recent trend. There is a trend in the area of unusually hot temperatures graph but I wonder how they addressed the development of heat islands in that data so I am skeptical. I see nothing happening to warrant alarm. His only quantitative claim is that “the temperatures of our Great Lakes are six degrees above average” but his claim does not withstand scrutiny. According to EPA’s Climate Change Indicators web page on Great Lake temperatures: “Since 1995, average surface water temperatures have increased slightly for each of the Great Lakes”, but that is nowhere near six degrees. The web site Great Lakes Statistics lists the current temperatures relative to their period of record starting in 1992 and all five lakes are currently less than two degrees above the mid-April average. Dr. Murphy says extreme weather events challenge us all too frequently insinuating that they are getting worse but, again, looking at data indicates no cause for alarm. In recent testimony before the House of Representatives, Dr. Roger A. Pielke, Jr. addressed trends of extreme events in the United States. He noted that global weather-related disaster losses as a percentage of Global GDP are trending down since 1990; that there is no trend in hurricane landfall frequency or intensity; that the IPCC noted no evidence of a trend for floods; that US flood impacts are going down; and that there low confidence in observed trends for hail or tornadoes. Dr. Murphy says that we experience mega droughts globally on a regular basis but Dr. Pielke quotes the IPCC: “there is low confidence in detection and attribution of changes in drought over global land areas since the mid-20th century”. If the Intergovernmental Panel on Climate Change concludes no trends in droughts then the only way we can interpret the regular basis comment is that this has been the case in the past and it continues today. His statement is not wrong but it also is not cause for alarm upon inspection either. GCMs have not been subject to the rigorous verification and validation that is the norm for engineering and regulatory science. There are valid concerns about a fundamental lack of predictability in the complex nonlinear climate system. There are numerous arguments supporting the conclusion that climate models are not fit for the purpose of identifying with high confidence the proportion of the 20th century warming that was human-caused as opposed to natural. There is growing evidence that climate models predict too much warming from increased atmospheric carbon dioxide. The climate model simulation results for the 21st century reported by the Intergovernmental Panel on Climate Change (IPCC) do not include key elements of climate variability, and hence are not useful as projections for how the 21st century climate will actually evolve. Finally, Dr. Murphy notes that Pruitt is not a scientist but is an attorney. Although Dr. Murphy is a chemist and not a meteorologist like me I don’t believe that a person’s background necessarily means much. Look at the evidence yourself. When you check the numbers and claims like I did then you can determine whether or not to believe whoever is making the claims. In this case I find little support for Dr. Murphy’s claims but readers should decide themselves. I have not found sufficient evidence to convince me that CO2 mitigation efforts are appropriate at this time. While it is very likely that human activities are the cause of at least some of the warming over the past 150 years the question is how much. There is no robust statistical correlation to indicate that CO2 is the primary driver. The failure of the climate models outline above clearly demonstrates the CAGW hypothesis is flawed. I conclude that our children and grandchildren are not in imminent danger from CAGW and would be better served by investments to make society more resilient to observed extreme weather rather than trying to mitigate CO2 emissions to try to prevent the speculative weather projected by the flawed models. I believe Administrator Pruitt’s agenda to reign in the ill-conceived CO2 mitigation programs of the Obama Administration is appropriate. On the other hand, I do not agree with any plans to cut the climate monitoring and observing programs at EPA and elsewhere. I support research into all the causes of climate change not just anthropogenic causes. Ultimately, until such time that a cheaper alternative to fossil fuels is available society will continue to use them because of their tremendous benefits. If you believe that we society should stop using fossil fuels then research and development for alternatives is appropriate. The poster child for this particular behavior is Dr. Michael Mann, Distinguished Professor of Atmospheric Science, Penn State University and Director, Penn State Earth System Science Center. On March 29, 2017 he gave testimony before the Committee on Science, Space and Technology that illustrates this phenomenon in three ways. I prepared a table summarizing Michael Mann testimony with general categories for the contents. There were 26 paragraphs. Dr. Mann used 4 paragraphs to describe his background. Thirteen paragraphs described either “anti-science” attacks on him or Dr. Thomas Karl and his rebuttals to those attacks, two paragraphs attacked other scientists and seven of the 26 paragraphs addressed the science of climate change. The first example of Principle 5 is the matter of personal attacks which are bad if they directed to him but OK if he is doing the attacking. The majority of his testimony addresses what he characterizes as “anti-science” attacks on him. He notes that “Science critics will therefore often select a single scientist to ridicule, hector, and intimidate.” However, his testimony then ridicules three out of the four individuals at the hearing because they “represent that tiny minority that reject this consensus or downplay its significance”. I think it is reprehensible and clear intimidation to label Dr. Judith Curry as a “climate science denier” equating her views of the consensus on climate change as equivalent to those who deny the Holocaust. He notes “I use the term carefully—reserving it for those who deny the most basic findings of the scientific community, which includes the fact that human activity is substantially or entirely responsible for the large-scale warming we have seen over the past century”. The second example is the scientific debate on climate change. Dr. Mann invokes the 97% consensus argument that “of scientists publishing in the field have all concluded, based on the evidence, that climate change is real, is human-caused, and is already having adverse impacts on us, our economy, and our planet”. But then goes on to say “there is indeed a robust, healthy, and respectful debate among scientists when it comes to interpreting data and testing hypotheses”. Obviously no debate is possible interpreting any data or hypotheses that climate change is human-caused. I am also troubled by his lack of qualifiers for what the referenced 97% consensus actually referred to. The third example is the proper channel for scientific debate. Dr. Mann states “True scientists are skeptics—real skeptics, contesting prevailing paradigms and challenging each other, in the peer-reviewed literature, at scientific meetings, and in seminars—the proper channels for good faith scientific debate.” However, he “proves” that James Hansen famous predictions from the 1980’s and 1990’s were successful by referencing the Real Climate blog. In Congressional testimony he mentions “the huge potential costs if the impacts turn out to be even greater than predicted, something that appears to be the case now with the potential rapid collapse of the West Antarctic Ice Sheet and the increased sea level rise that will come with it.” His citation is a newspaper article “Climate Model Predicts West Antarctic Ice Sheet Could Melt Rapidly” by Justin Gillis, New York Times, March 30, 2016. Two examples of precisely the improper channel he was alluding to in his description of good faith scientific debate. One final point regarding this testimony. Dr. Mann notes that he coined the term “Serengeti strategy” to characterize his attackers. He describes this as when special interests “single out individual scientists to attack in much the same way lions of the Serengeti single out an individual zebra from the herd”. He is blissfully unaware that his moral of the story “In numbers there is strength, but individuals are far more vulnerable” may not be the whole story. My impression is that the lions single out the weakest link in the herd: the old, the sick, the young and, dare I say it, the one with the weakest arguments. The basis of this claim is the Synapse Energy Economics report prepared for the Riverkeeper and Natural Resources Defense Council entitled “Replacement Energy and Capacity Resources for the Indian Point Energy Center Under New York Clean Energy Standard (CES)” that claims that replacing Indian Point can be done with a combination of renewables and energy efficiency. This post addresses that report. I am generally skeptical of the Synapse report for two fundamental reasons. The report is sponsored by organizations that don’t want Indian Point or central power stations in general and also support development of renewable energy. It would not be presented to the public if it did not support their goals and objectives. Secondly, the analysis uses the National Renewable Energy Laboratory (NREL) ReEDS (Regional Energy Deployment System) modeling system. Clearly this organization has specific goals in mind and I doubt that they would have developed a model that did not support their renewable energy goals. These reasons do not necessarily say that the results should be dismissed out of hand but it does suggest that the results have to show no signs of bias towards a pre-determined result to be valid. In order to determine whether there is bias it is necessary to dig into the approach. ReEDS is a” long‐term capacity expansion and dispatch model of the electric power system in the lower 48 states”. The report notes that it has a “high level of renewable energy resource detail with many wind and solar resource regions, each with availability by resource class and unique grid connection costs”. Capacity, dispatch and load planning models are complicated and the characterization of the grid is a particular problem for New York. EPA and RGGI have relied on a similar model called the Integrated Planning Model that is notorious for its mis-characterization of the New York grid with the particular problem being transmission constraints to New York City and Long Island. EPA uses a version that has yet to get it right but New York’s influence in RGGI has led to a version that is acceptable in this regard. In the absence of a thorough review of the model I doubt that ReEDShas been tuned to correctly characterize this problem. If not, the fact that there are transmission constraints can lead to poor estimates of future load and capacity development making it easier to claim that renewables can be integrated easily. In other words, the modeling assumes that energy efficiency gains will occur despite the lack of a mechanism for it to occur. Furthermore, the insinuation that the renewable goal will be met because there is a binding order misses the point that the goal may not be achievable. I am a fan of energy efficiency because it has no regrets. In other words because there is no completely benign way to make electricity reducing the amount you need is a very good thing. Moreover, you can target the energy efficiency and conservation funding so that those least able to pay for their energy get direct benefits. As a result even if it turns out that we don’t need to reduce CO2 emissions because of its impact on climate we still get benefits from this approach. Unfortunately I have qualms about the capability of energy efficiency to provide a significant amount of replacement power for Indian Point. First and foremost is simply accounting for energy efficiency. The Clean Energy Ministerial discusses the obstacles to assessing energy efficiency gains and notes “Because savings represent the absence of energy use, it is impossible to directly measure energy efficiency impacts”. In the absence of direct measurements it is therefore necessary to estimate energy use in the absence of the energy efficiency savings project. I would hope that the CES order clearly defines the metrics for these estimates so that they are credible, certain and consistent. Frankly, the lack of documentation thus far in the CES does not give me hope in this regard. One aspect to the continuing aggressive efficiency goals that I have not seen addressed is market saturation. A significant fraction of New York’s RGGI investments have been allocated to energy efficiency and those investments were preceded by years of subsidies for energy efficiency in other programs. An anecdote is just to consider household conservation. Once all the windows and doors have been replaced by more efficient versions, investing in even better ones will not be as cost effective. After you have spent money to do the obvious things any future investments cost more but yield less relative improvement. My point is that the Synapse projections of further efficiency goals do not include assessments of what is available. Instead they simply assume that the CES goals will be met and that even more reductions are possible if we throw even more money into the programs. Finally there are concerns about the “rebound effect” that suggest that maintaining the proposed level of annual incremental savings is ambitious. The “rebound effect” is when an improvement in energy efficiency triggers an increase in demand for energy. The impact of this effect is controversial and there is much uncertainty regarding the magnitude of rebound effects associated with energy efficiency improvements. The renewable goals are similarly based on assuming that the CES requirements will be met. The Synapse report states: “We incorporated New York State CES parameters into our projection of load and resource requirements. These parameters include CES‐assumed increased levels of energy efficiency and meeting the 50 by ’30 renewable energy requirement. We reflect New York’s target of obtaining 2,400 MW of offshore wind energy by 2030 in all scenarios, staged to reflect 600/1200/1800/2400 MW attained by, respectively, 2024/2026/2028/2030.” In 2015 3,398 MW of new offshore capacity was added worldwide, bringing the total to over 12,107 MW according to the Global Wind Energy Council. In theory that should mean that New York can install 2,400 by 2030 but it should be noted that New York’s total on-shore wind capacity in 2015 was 1,891 MW. The biggest failing in this report is the lack of cost data. The report notes that their cost comparison is “not meant to be definitive in the absolute sense; rather we use a consistent framework across the different scenarios in order to ascertain relative cost patterns”. This modeling purports to show that their preferred alternative is cheaper than other choices using their relative costs. What is missing is the overall cost. The fact that the ReEDS model which “builds” off-shore wind capacity based in part on economics had to be adjusted by Synapse to “hard-wire” the capacity built to match the CES requirement suggests that ReEDS is not as optimistic about that resource. Furthermore, it has been noted that “The average household in Germany contributes an estimated 240 euros a year to renewable energy subsidies.” is not reassuring in this regard. I will conclude this post with some particular issues with the modeling that may indicate problems with the results. The model “incorporates the addition of previously committed gas‐fired generation in the region in 2018” and cites the “CPV Valley unit, at 650 MW; and a generic combustion turbine unit at 90 MW”. The CPV unit is expected to be online in 2018 but instead of 90 MW of new combustion turbine capacity the Cricket Valley station alone is 1,100 MW This plant is permitted, under construction and expected to be on line in the first quarter of 2020. That means that renewables will not be displacing old inefficient fossil-fired generation but the latest and most efficient fossil technology. Another assumption used in all the modeling scenarios is that there will be a 2.5% decline in the RGGI cap which has been proposed by Governor Cuomo but is not yet RGGI policy. When I model something the first thing I check is the results relative to recent observations. I have a couple of problems with projections for 2016 compared to actual values. For example, the model’s estimate of 2016 CO2 emissions is 20% higher than actual emissions. When a model over estimates a key parameter by 20% in the first year I don’t put much weight into their projections in 2030. Another issue is the 2016 wind generation estimate of 5 TWh when the 2015 observed wind generation was only 4 TWh. It is highly unlikely that the wind generation will increase 20% in one year so that is another likely over-estimate. I have posted three tables with model projections for all six model runs for 2018, 2022 and 2030. Synapse Synapse Energy Generation and Capacity Appendix A Scenarios describes the model runs. Synapse Energy Generation and Capacity Appendix A Comparison of Generation Estimates describes the generation (TWh) estimates and Synapse Energy Generation and Capacity Appendix A Comparison of Capacity (MW) Estimates describes the (MW) estimates for fourteen different source-type categories. I have issues with some of those category results. The scenarios address the Indian Point retirements so the nuclear estimates show that. Note that those projections assume no changes in the upstate nuclear units. Cuomo’s war on coal is reflected in shutting down the remaining coal plants. One of the unintended consequences of the renewable and energy efficiency is the effect on the profitability of the remaining fossil stations. For example, in the gas category there is a projected reduction in gas capacity of 21% from 2018 to 2030 in Scenario A6 but the generation drops 74%. My concern is that the drop in the generation from those facilities will mean that they cannot remain viable without a capacity payment. For new gas note that the exclusion of Cricket Valley means that their 2022 estimate of just over 5 Twh of generation is less than half of what I expect if Cricket Valley runs as expected. The wind estimates are all at least three times the observed 2015 NYS generation which confirms my expectation that aggressive wind development is necessary in these projections. It is also not clear why the wind generation projections in all four scenarios are less than either reference case. Even more vexing is that solar in the last scenario does not increase from 2018 to 2030. I am guessing that the solar money goes to aggressive energy efficiency. Note that the modeling assumes several fold increases in DG PV capacity. The last category that I want to address is oil-gas-steam. New York is unique in its reliance on this source category as backup for emergencies. Unless a production cost model is specifically tuned to New York then this is an easy category to turn down. However, reducing the generation, much less the capacity, is not as simple as it appears on first glance because of the role these units cover. I do not think those category estimates are realistic. Ultimately this modeling exercise is a good example of Pragmatic Environmentalist Principle 4: We can do almost anything we want, but we can’t do everything. In the absence of absolute estimates I can only guess what the ultimate costs will be but the German experience of 20 euros per month for renewables is not comforting. I cannot endorse this approach because I fear the additional costs of renewables will divert too much of the state’s resources relative to other needs. New York State has to invest $40 billion in its water infrastructure just to provide clean water and treat wastewater. In my opinion investing in that immediate need and energy efficiency is a more appropriate social policy than subsidizing renewable energy. If, in fact, Indian Point has to close I suggest that accepting that its replacement power will have to include fossil generation is necessary. Since the publication of my original post on this topic I realized that there were two natural gas fired combined cycle electric generating units in development and not just the one I thought. This update to the original post addresses the ramifications of that on replacement power and other emissions. Because the additional facility affects the conclusions I revised the entire post. New York’s Governor Andrew Cuomo has threatened the closure of the Indian Point Energy Center located 25 miles north of New York City since his election and in January 2017 announced its closure by April 2021. Cuomo claims that Indian Point produces 2,000 megawatts of electrical power and that “more than enough replacement power to replace this capacity will be available by 2021”. However, the problem is what are the characteristics of the replacement power relative to Indian Point? Indian Point’s nameplate capacity is 2,311 MW not 2,000 as described. Nuclear power is characterized by high capacity factors and because Indian Point provides over 20% of New York City’s power the location of the replacement generation matters. There are three projects that can replace that capacity and are at least located near New York City. Champlain Hudson Power Express transmission line has been permitted to bring 1,000 MW of Hydro Quebec hydropower into New York City but construction has not started. The Cricket Valley Energy Center is a 1,000 megawatt combined-cycle, natural gas fired generating plant that has just started construction and is expected to be on-line the first quarter of 2020. I did not include the CPV Valley Energy Center in the first post. It is a 650 MW combined-cycle, electric generating plant that is scheduled to go on line in February 2018. In the original post I did not include CPV Valley so the claim of 2,000 MW so I disputed the claim that the replacement power was readily available but with adding it that claim is correct. The remaining and more subtle issue is whether these three facilities can replace Indian Point and not jeopardize other environmental goals. I have been involved in the RGGI program process since its inception. Before retirement from a Non-Regulated Generating company, I was actively analyzing air quality regulations that could affect company operations and was responsible for the emissions data used for compliance. The opinions expressed in this post do not reflect the position of any of my previous employers or any other company I have been associated with, these comments are mine alone. Replacement Power: Indian Point produces 2,000 megawatts of electrical power. Currently, transmission upgrades and efficiency measures totaling over 700 megawatts are already in-service. Several generation resources are also fully permitted and readily available to come online by 2021, after the plant’s closure, including clean, renewable hydropower able to replace up to 1,000 megawatts of power. Together, these sources will be able to generate more than enough electrical power to replace Indian Point’s capacity by 2021. No Net Increase of Emissions Due to Closure: The Governor’s leadership on energy and climate change will ensure that Indian Point’s closure will not have an adverse impact on carbon emissions at the regional level. Through the Regional Greenhouse Gas Initiative, the state will continue to drive reductions in greenhouse gases across the power sector. Further, the Governor’s Clean Energy Standard to get 50 percent of New York’s electricity from renewables by 2030 is the most comprehensive and ambitious mandate in the state’s history to fight climate change, reduce harmful air pollution, and ensure a diverse and reliable energy supply at affordable prices. Early Close Date: Entergy Corp. has agreed to cease all operations at Indian Point and will shut down the Unit 2 reactor in April of 2020. Unit 3 will be shut down in April of 2021. Unit 1 reactor was permanently shut down in October 1974 because the emergency core cooling system did not meet regulatory requirements. In the event of an emergency situation such as a terrorist attack affecting electricity generation, the State may agree to allow Indian Point to continue operating in 2-year increments but no later than April 2024 and April 2025 for Units 2 and 3 respectively. Negligible Bill Impact: The Public Service Commission’s Indian Point Contingency Plan and other planning efforts have ensured that more than adequate power resources are able to come online by 2021 to ensure reliability of the power grid. Given these planning efforts and likely replacement resources, the plant’s closure in 2021 will have little to no effect on New Yorkers’ electricity bills. There are two aspects of power generation that have to be considered when discussing replacements. The potential power output or name plate capacity and the actual generation produced. The New York State Independent Operator annual load and capacity report, the “Gold Book” provides that information. The name plate capacity of Indian Point 2 is 1,299 MW and Indian Point 3 is 1,012 MW. The average net generation from 2011 to 2015 from Indian Point 2 was 8,530 GWh and from Indian Point 3 was 8,422 GWh or 16,953 GWh from the facility. My point is that the net generation is the key parameter for replacement not the capacity. In order to determine whether the Governor’s plan holds water we have to parse the press release. The first suggested component is “transmission upgrades and efficiency measures totaling over 700 MW that are already in-service”. In the original post I noted that I had trouble understanding how these measures will replace observed generation, but have since found a reference with an explanation. The New York Independent System Operator (NYISO) publishes an annual description of power trends. This is an absolute necessity due to the changes in the New York State electric system driven by the Governor’s Clean Energy Standard and Reforming the Energy Vision. The 2016 Power Trends document provided an explanation of the transmission projects. These projects were designed to increase the transfer capability into Southeastern NY so that excess upstate NY capacity could be transmitted to the region served by Indian Point. According to this document the transfer capacity was raised by 450 megawatts. New York State has always had constraints on the amount of power that could be transmitted from upstate to downstate. These projects should be able to replace Indian Point generation that is used in the New York City area. However, I don’t think it is a like kind replacement of no-pollutant generation. While it can clearly move the upstate wind and solar power downstate, the upstate renewable facilities are not constrained by system needs. If they can generate then they do. The same argument can be made for the upstate nuclear power. If the nukes can run then they do. In other words, their generation is already being used elsewhere and is not going to provide added generation that can be transmitted downstate by these upgrades. Instead, the upstate replacement generation that can be transferred to downstate to make up the 450 MW will either be existing under-utilized fossil generation or new renewables. If it is fossil generation then there will be an increase in CO2 and other pollutants. If it is renewable then it is not new renewable that is going to be used to increase the amount of no-CO2 generation. Instead it is only going to replace the loss of the no-CO2 nuclear generation. In either case because Governor Cuomo has established goals for more renewables the source of the power from these transfer capacity improvements should be addressed. The aforementioned NYISO 2015 Gold Book also notes that it also included 125 MW of additional demand response and combined heat and power resources to be implemented by Consolidated Edison, some of which is already in effect. The problem is that the 450 MW transmission upgrades these additional resources do not sum up to 700 MW. The press release notes that “several generation resources are also fully permitted and readily available to come online by 2021, after the plant’s closure, including clean, renewable hydropower able to replace up to 1,000 megawatts of power.” I assume that the hydropower replacement refers to Champlain Hudson Power Express. According to the Champlain Hudson Power Express web site the project will bring up to 1,000 megawatts (MW) of clean, renewable power to the New York metro area. This is consistent with the press release. However the question is whether the three projects that are permitted can replace all 16,953 GWh of the generation from Indian Point. For the purposes of this analysis assume that Champlain Hudson Power Express power can be provided 100% of the time. With that assumption, it provides 8,760 GWh of power so we still have to replace 8,193 GWh of Indian Point Generation. According to the Cricket Valley web site this is a proposed 1,000 megawatt (MW) combined-cycle, natural gas-fired generating plant in Dover, NY that is expected to be on line by the first quarter of 2020. I could not find a proposed capacity factor (actual generation divided by the maximum potential generation) so assumed 80% which would produce 7,008 GWh. CPV Valley Energy Center is a 650 MW combined-cycle, natural gas-fired generating plant near Middletown, NY that is much further along and expected to be online in February 2018. Assuming an 80% capacity factor for this plant gives 4,555 GWh so these three facilities can provide over 3,300 GWh more than Indian point generated. This revised post also addressed the claim that the plan is supposed to lead to no net increase of emissions due to closure. The emphasis has always been on carbon “pollution” and the press release is careful to claim no adverse impact on carbon emissions at the regional level skirting the question whether NY emissions will increase. Cricket Valley and CPV Valley both will emit carbon. Cricket Valley has an annual limit of 3,630,484 tons of GHG emissions and CPV Valley has an annual limit of 2,164,438 tons of CO2. To some extent in any scenario both facilities will displace Indian Point rather other fossil-fired facilities and those emissions will increase New York’s total emissions. Of more concern to me are Nitrogen Oxides. The final Cross State Air Pollution Rule allowance budget and the Governor’s policies on allowance distributions could lead to a problem covering emissions with allowances (a topic for a separate post). If the generation gap from the closure of Indian Point is made up by the three projects described above, CPV Valley and Cricket Valley would increase annual NOx emissions by 289 tons. Emissions in the 2016 ozone season were 6,521 and the future allowance budget is only 5,135 tons so any increase in emissions is a further strain on the budget. New York State has aggressively pursued NOx reduction policies and there are not many opportunities left for additional reductions so any increase is problematic. These sections from the original post are included for your information. No changes were made to the following paragraphs. The schedule is for Entergy Corp. to shut down the Unit 2 reactor in April 2020 and Unit 3 in April 2021. The State may agree to allow Indian Point to continue operating in 2-year increments but no later than April 2024 and April 2025 for Units 2 and 3 respectively. Both the Champlain Express and Cricket Valley projects have been permitted but neither has started construction. The expected construction time for Champlain Express is three and a half years which means that it will not be ready by April 2020. Because natural gas combined cycle plants have relatively short construction times it probably will meet the first closure date if construction begins soon. I strongly believe that no new generation facility greater than 25 MW in New York State can be permitted in less than five years because of the extraordinary policies in place so nothing else could be permitted and constructed by the second closure date. So I expect that the extensions will be needed. The Governor claims there will be negligible bill impact because of planning efforts and likely replacement resources. I am not an economist but the expected costs of Champlain Express is $2.2 billion and Cricket Valley is $1.5 billion have to be paid for somewhere. Surely the costs to continue operating Indian Point are less than that. Why won’t pre-mature retirement of this resource have a bill impact? How Much Has the Regional Greenhouse Gas Initiative Reduced Other Pollutant Emissions? The Regional Greenhouse Gas Initiative (RGGI) was supposed to be nearing completion of a 2016 Program Review but the election of Donald Trump and the fate of the national Clean Power Plan has delayed that process. This is the third post in a series of posts that will discuss how RGGI has fared so far and how that could affect the program review. As noted previously, I believe that RGGI allowance prices add to the cost of doing business but because the cost of allowances can be added into the bid price it is a nuisance and not a driver of decisions. This post addresses the effect RGGI has had on other pollutants as estimated by Abt Associates: Analysis of the Public Health Impacts of the Regional Greenhouse Gas Initiative, 2009 -2014. According to the Energy Coordinating Agency this report shows that since 2009, RGGI has significantly reduced air pollution from fossil fuel power plants. The report goes on to estimate improvements to the health of people living in the Northeast as a result of those pollution reductions. According to the study the effort to curb carbon emissions has prevented 300-830 adult deaths, avoided 13,000 – 16,000 respiratory illnesses and staved off 39,000 – 47,000 lost work days for workers. I will briefly describe the three steps that Abt Associates used in their analysis. This post will primarily analyze the first step in their process. I compare their predicted generation and emissions reductions relative to the total reductions observed in the measured data. For the last two steps I offer some general comments. Step 1: Estimate annual changes in electric generation and emissions of air pollutants at power plants as a result of RGGI implementation from 2009 to 2014 using electricity dispatch modeling and EPA emissions data for EGUs. Step 3: Assess public health impacts associated with changes in air quality due to RGGI implementation from 2009 to 2014. EPA Benefits Mapping and Analysis Program (BenMAP). In competitive electricity markets, changes in any number of variables, including fuel prices, weather, and plant and system operational changes, can cause variations in the level of electricity dispatched by a given power plant (or group of plants) from year to year. In this analysis, however, our modeling results account for all of these factors and thereby isolate the incremental effect of RGGI on electricity markets and dispatch. Thus, we interpret RGGI-induced changes in generation to be a result of the combination of (1) RGGI states’ investments in energy efficiency and renewable energy and (2) the effect of CO2 allowance prices on electricity dispatch. Therefore their Table 4 results in Comparison of Abt Associates Generation Changes Due to RGGI relative to Total Generation Changes are the reductions they assume that would not have occurred were it not for RGGI. Let’s try to compare their estimates with the total generation reductions that occurred. I used measured data for my estimate of the total load reduction and that methodology has differences relative to their approach. I assume that their annual differences in Table 4 are relative to 2008. The EPA Clean Air Markets Division website provides gross load generation data from all electric generating units that participate in RGGI. Modeling electricity generation in their approach uses net load so there is a difference there. In my analysis I did not include New Jersey and they did for the first compliance period. I did not go to the effort to manually include only those sources that participate in RGGI for the 2008 data. Instead I calculated the load from all programs that report to EPA in 2008. I believe that is a minor error because the difference in the RGGI only and “All Program” data sets in the years 2009-2014 ranged from 0.50% to 0.71%. In my approach I calculated the total change in generation from 2008. The Abt Associates approach calculated reductions in annual generation ranging from a low of 2.0 percent in 2011 to a high of 7.0 percent in 2013. The difference in gross load between 2008 and the six years in the first two RGGI compliance periods ranged from a low of 3.5% in 2010 to a high of 18.7% in 2014. If we assume the two approaches are compatible, then we can estimate the fraction of the total reduction resulting from the Abt Associates estimates of RGGI investments and CO2 allowance prices on electricity dispatch. In 2010, this comparison suggests that the fraction of reductions induced by RGGI was over 80% of the total reduction. Even in the lowest year, 2011, the fraction of reductions induced by RGGI was 26.4%. The upper bound in CO2 emissions reductions due to RGGI is an econometric model that estimates that emissions would have been 24 percent higher without the program. RGGI estimates that emissions would have been 17% higher than without a program. If you assume that all the savings in fossil fuel use only displaced natural gas use instead of some other aggregation of fuels then emissions would have been only 5% higher. These numbers are starkly different and need to be addressed before the Abt Associates analysis can be considered credible. To that end I recommend that Abt Associates provide their CO2 emission reduction estimates. In the first step Abt Associates estimated annual changes in electric generation and emissions of air pollutants at power plants as a result of RGGI implementation from 2009 to 2014 using electricity dispatch modeling and EPA emissions data for Electric Generating Units (EGUs). Essentially they are estimating the emissions that would have occurred were it not for the RGGI investments and CO2 adder cost to the dispatch cost of the plants. Using the same methodology as for the generation estimate I calculated the total emission reductions. Sulfur dioxide cumulative reductions from a 2008 baseline totaled 1,673,601 tons from all nine RGGI states compared to the ABT Associates estimated impact of RGGI reduction of 109,000 tons so the estimated reduction of RGGI is 6.5% of the total. Nitrogen oxides cumulative reductions from a 2008 baseline totaled 335,440 tons from all nine RGGI states compared to the ABT Associates estimated impact of RGGI reduction of 46,000 tons so the estimated reduction of RGGI is 13.7% of the total. While I have reservations that RGGI had any impact other than from the load associated with RGGI investments, I can accept them as upper bound estimates of the SO2 and NOx emission reductions due to RGGI. COBRA contains detailed emission estimates of PM2.5, S02, NOX, NH3, and VOCs for the year 2017 as developed by the U.S. EPA. Users create their own scenario by specifying increases or decreases to the baseline emission estimates. Emission changes can be entered at the county, state, or national levels, and outcomes can be modeled nationwide or for smaller geographic areas. COBRA uses a reduced form air quality model, the Source-Receptor (S–R) Matrix, to estimate the effects of emission changes on ambient PM. Using an approach to estimating avoided health impacts and monetized benefits that is generally consistent with EPA practice, the model translates the ambient PM changes into human health effects and monetizes them. Users can view the results in tabular or geographic form. There are multiple problems with this model for this application. EPA notes that it is “inflexible and simple” such that it is limited to the 2017 timeframe and there is no ability to import a different baseline. Abt Associates applied the model to different periods and used a different baseline. The RGGI sources are point sources and this model does not address their specific factors that convert emissions from these plants to particulate matter as opposed to the generic factors used. Finally, note that all the air quality impacts are a function of particulate matter. Secondly, BenMAp “estimates the number and economic value of heath impacts resulting from changes in air quality – specifically, ground-level ozone and fine particles but note that the COBRA impacts are solely based on particulate matter. The model presumes that the health impacts of both pollutants include premature death and aggravated asthma. Ambient levels of sulfur dioxide, nitrogen oxides and particulate matter have all been reduced in recent years but at the same time asthma rates have been increasing. This inconsistency needs to be addressed before this approach can be accepted. There also is a deeper issue associated with EPA epidemiological work with PM and health impacts that is the basis of BenMAP. EPA’s epidemiological work is based on data sets that are not available for independent review, were prepared by organizations that were being paid by EPA (and would lose funding if this were not an issue) and the relationship they claim is not present in other similar data sets. Moreover, EPA has yet to determine the specific effect of PM on humans that triggers the claimed impacts of their epidemiological studies. Given those limitations I do not accept these health effects. I encourage you read Steve Milloy’s book “Scare Pollution: Why and How to Fix the EPA” (2016) Bench Press for the complete story of this travesty. Finally, we can make an order of magnitude estimate of the health outcomes using their methodology by simply scaling their emission reductions relative to the total emission reductions (Abt Associates Cumulative RGGI Health Benefits and Total Cumulative Health Benefits, 2009-2014). This estimate does not account for even the gross site specific implications of the Abt Associates analysis. However, because the air quality estimated concentrations are proportional to the emissions input the general concept is acceptable. There is one other gross assumption. Because fine particulates in the northeast are primarily related to SO2 and BenMAP calculates health impacts of particulates, I only scaled the SO2 emissions to predict the health impact differences. My point of these numbers is that the predicted impacts are large enough that someone should be able to prove this model works by evaluating the observed health effect data. Until that is done I will remain skeptical of this approach. Not to be petty but in order for an analysis to be useful in public policy debate the results have to be reproducible. This analysis went out of its way to make replicating their numbers difficult. Frankly when there are obvious obfuscations you start to wonder if it was deliberate. To prevent that perception providing numbers up front is the safest course. Also note that I did ask the corresponding author for data but did not get a response. The following is a list of specific whiny issues I had with the report. What was the baseline? I could not find this definition anywhere. I assume that because annual numbers were used that the year before the program started was the baseline. In my previous analyses of RGGI data I use the three-year period 2006 to 2008 as the baseline to compare with the three-year RGGI compliance periods. SO2 and NOX data in metric tons. I do not understand why the emissions are reported in metric tons. In order to compare their results with any EPA report they have to be converted. Moreover, the input to the COBRA model is in short tons. No tables with numbers. In order to compare their projections with actual emissions I had to manually scale bars on their figures. I think my estimates are good enough but this was an unnecessary hassle. No CO2 reductions report. This was serious enough to include in the main body but bears repeating. In order for this study to be credible it needs to be compared to previous work. Without CO2 that is impossible. Emission reductions in Figures 6 and 8 don’t add up to the emission reductions in Figure 7. After manually estimating the bars in the two figures it was very frustrating to find they didn’t match their totals. Double checking my work it is clear that there is a mistake in the Abt numbers. Author rogercaiazzaPosted on March 5, 2017 April 30, 2017 Categories Regional Greenhouse Gas InitiativeLeave a comment on How Much Has the Regional Greenhouse Gas Initiative Reduced Other Pollutant Emissions? How Much Has the Regional Greenhouse Gas Initiative Reduced CO2 Emissions? The Regional Greenhouse Gas Initiative (RGGI) was supposed to be nearing completion of a 2016 Program Review but the election of Donald Trump and the fate of the national Clean Power Plan has delayed that process. This is the second post in a series of posts that will discuss how RGGI has fared so far and how that could affect the program review. As noted previously, I believe that RGGI allowance prices add to the cost of doing business but because the cost of allowances can be added into the bid price it is a nuisance and not a driver of decisions. I will show how this added cost ultimately affects emissions in this post. For this analysis the RGGI reductions in the first two compliance periods of 2009-2011 and 2012-2014 will be compared to a pre-program baseline of 2006-2008. Note that this is an update to the estimates provided in an earlier post to incorporate RGGI’s latest Investment Summary Report . table-1-rggi-annual-co2-changes lists the changes in CO2 emissions in the RGGI states by fuel type. Note that this analysis uses EPA data and is not completely compatible with the RGGI affected source inventory. The total and fuel-type specific annual emissions were subtracted from the baseline to get the reductions during the RGGI program. For the facilities in this dataset in the 2012-2104 compliance period there has been a 36 million ton reduction from the 127 million ton baseline or a 28% reduction. Note that coal and residual oil emissions dropped 49 million tons from the baseline of 85 million tons or 57%. Natural gas emissions increased 13 million tons and other solids (mostly wood) increased 0.5 million tons. Over the same time period, gross loads and steam load declined 20% and 55%, respectively. According to the most recent RGGI Investment Summary Report “The lifetime effects of these RGGI investments are projected to save 76.1 million MMBtu of fossil fuel energy and 20.6 million MWh of electricity, avoiding the release of approximately 15.4 million short tons of carbon pollution.” In the 2012-2014 compliance period RGGI CO2 emissions were 91,421,635 tons of CO2 so based on this RGGI report were it not for RGGI there would have been 15.4 million more tons of CO2 emitted so total emissions would have been 106,821,635 tons. I also calculated the percentage difference with and without the program and that shows emissions would have been 17% higher than without the program. A paper by Murray and Maniloff (2015) includes an estimate of RGGI program emission reductions. They concluded that “after the introduction of RGGI in 2009 the region’s emissions would have been 24 percent higher without the program, accounting for about half of the region’s emissions reductions during that time”. The April 29 2016 RGGI stakeholder presentation described that paper and further suggested that “The other half is due to recession, complementary environmental programs and lowered natural gas prices.” The results in this paper are based on an econometric modelling analysis. After the publication of the Murray and Maniloff paper I contacted the authors with my reservations about their approach. After an initial response from Dr. Maniloff to my reservations I never received a follow up to my response. One disagreement was whether CO2 is different than all other air pollutants such that this undermines their explanation of how firms react to carbon constraints. I took exception to their characterization “firms facing a future carbon price regime may have reacted by retooling power plants to lower emitting processes in advance of the regulation taking effect”. I noted that there are no end of pipe abatement technologies for CO2, as there are for other pollutants (e.g. SO2 scrubbers) save for CCS which is not economic. Dr Maniloff responded that “this hardly means there are not actions that can be taken in response to the carbon constraints. Plants can improve efficiency (heat rate) at fossil units as they have, and firms can engage in fuel switching/redispatch from coal and oil to gas and renewables, as they have.” I responded that this is fine in theory but in practice, especially in a de-regulated market, the control strategy is to simply run with the allowances that are purchased. Heat rate improvements run the risk of running afoul of New Source Review requirements. If EPA determines that facility upgrades improve performance above their thresholds, then that the facility must upgrade its pollution control equipment to new source standards. Improvement to heat rate would likely throw the facility into NSR immediately and the costs of that equipment cannot be directly recovered in the bid price and those costs would overwhelm any value to RGGI compliance. The cost of carbon has been so low relative to the fuel cost that a switch to natural gas was the driver only based on fuel costs. Affected de-regulated sources do not re-dispatch to the operator’s renewables, they simply run less. Practically speaking for RGGI affected sources CO2 control was different because the only viable option was to run based on allowances purchased. I think the biggest problem is that econometric models cannot fully account for site specific regulation impacts. No model can account for all the effects of regulations on company decisions to invest in new control equipment unless each facility is explicitly considered. Because of my particular experience in New York I have explicitly considered the factors affecting particular facilities when analyzing the impact of regulations. Consider, for example, the coal-fired RG&E Russel station in Rochester, NY and the NRG Huntley station outside Buffalo, NY. Before RGGI began the owners were faced with decisions for the future. Before 2009, Russel station needed to invest in pollution control equipment for particulates, Hg and NOx or the facility would not be able to operate and meet emission compliance requirements already on the books. It operated from 2006-2008 (emitting ~ one million tons of CO2) but retired before 2009. I believe the owners decided that they might not be able to recover the costs for all the pollution control equipment over time so they decided to retire the facility. RGGI compliance is only an issue when the unit runs and simply adding the allowance cost to the bid price insures that cost is recovered. Therefore, I conclude that none of the observed reductions from this facility can be ascribed to RGGI. At the other end of the spectrum for New York coal facilities is Huntley. This facility retired in early 2016 even though its owners made investments in pollution controls to meet the opacity, Hg and NOx limits. Despite those investments the facility closed like many other coal-fired plants because the operating cost of burning coal was not competitive with gas-fired competition. Presumably the erosion of load due to the recession and loss of manufacturing higher load requirements also played a factor. It can be argued that adding the allowance price to their bids meant the unit ran less. In practice I believe that this factor was small. It is only when the added price is enough to change the order of the bids in a step-wise fashion that there is an effect. My understanding is that the allowance price is so small relative to the fuel price differential that it was inconsequential. Given the range of factors affecting these coal units we can assume that New York coal retirements and operating reductions are more likely due to non-RGGI factors than RGGI itself. Ultimately, look at it this way – in the absence of RGGI the facilities would still have retired so any modeling approach that presumes that RGGI influenced the NYS coal retirements is wrong. The lower bound for RGGI program CO2 emissions reductions during this period can also be estimated. It can be argued that the coal and residual oil emissions were lower due solely to the changes in cost differences relative to natural gas and additional regulations and compliance pressure for NOx, Hg, and (in New York) opacity. This assumes that RGGI compliance is incorporated into the bid price and so was not a driver in facility pollution control decisions. Making those assumptions then means that the CO2 reductions directly due to RGGI should be the savings of 76.1 million mmBtu of generation from natural gas specifically and the natural gas emission factor for CO2 should be used for CO2 displacement. Table 3 lists this calculated value, 4,452,850 tons. This calculation shows that emissions would have been only 5% higher than without the program. To summarize, there is a range of CO2 emissions with and without RGGI based on assumptions and methodology. The upper bound is an econometric model that estimates that emissions would have been 24 percent higher without the program. RGGI estimates that emissions would have been 17% higher than without a program. If you assume that all the savings in fossil fuel use only displaced natural gas use then emissions would have been only 5% higher. Author rogercaiazzaPosted on February 25, 2017 April 30, 2017 Categories Regional Greenhouse Gas InitiativeLeave a comment on How Much Has the Regional Greenhouse Gas Initiative Reduced CO2 Emissions? Has the Regional Greenhouse Gas Initiative Been Successful? The Regional Greenhouse Gas Initiative (RGGI) was supposed to be nearing completion of a 2016 Program Review but the election of Donald Trump and the fate of the national Clean Power Plan has delayed that process. This is the first post in a series of posts that will discuss how RGGI has fared so far. This particular post will provide background information so that I don’t have to include it every time. The RGGI stakeholder process is dominated by its adherents and now that I am retired I can offer an alternative view of the program. In this post I will offer my thoughts on whether the program has been successful. Proceeds from the Regional Greenhouse Gas Initiative (RGGI) have powered an investment of $1.37 billion in the energy future of the New England and Mid-Atlantic states. This report reviews the benefits of programs funded through 2014 by RGGI investments, which have reduced harmful carbon dioxide (CO2) pollution while spurring local economic growth and job creation. The lifetime effects of these RGGI investments are projected to save 76.1 million MMBtu of fossil fuel energy and 20.6 million MWh of electricity, avoiding the release of approximately 15.4 million short tons of carbon pollution. I have been involved in the RGGI program process since its inception. Before retirement from a Non-Regulated Generating company, I was actively analyzing air quality regulations that could affect company operations and was responsible for the emissions data used for compliance. From that background let’s look at the RGGI results quoted above. The biggest flaw in the adherent’s vision of RGGI success is that RGGI is a driver of affected source decisions. In my opinion based on my experience and discussion with company folks responsible for the economics and operations of affected facilities where I worked and elsewhere, RGGI is simply a tax. Yes it adds to the cost of doing business but because the cost of allowances can be added into the bid price it is a nuisance and not a driver of decisions. I will address how this added cost ultimately affects emissions in a later post. When RGGI notes that $1.37 billion is being invested in the energy future of the New England and Mid-Atlantic states that number reflects the proceeds from the allowance auctions aka the tax. Because this is a carbon tax there a couple of cautionary tales. The reference notes that the nine participating RGGI states received $1.79 billion in auction proceeds in the period covered by this report. RGGI investments represent $1.37 billion spent to date and another $329.4 million is committed to 2015 and future programs. Note that these numbers do not total up. Despite best intentions by those folks who set up the program $93.1 million has been transferred to state general funds by politicians. In other words any carbon tax should have iron clad specifications on how the money will be used or politicians will get involved and co-opt the stated goal of the tax. In RGGI the stated goal was to invest the RGGI proceeds in programs that would ultimately reduce carbon emissions and protect the rate-payers. The Investment Summary Report notes the fraction of funding that reduce carbon emissions (overall 80%) for energy efficiency (57%), clean & renewable energy (15%), and GHG abatement (8%) programs. Direct bill assistance (15%) is a more difficult sell as a carbon abatement program but because increased costs to the consumer disproportionately affect those least able to afford those increases I personally can live with those programs. However, 4% of the funds went to “administration” and another 1% to the RGGI organization itself. Clearly when big bucks are involved politicians are not the only ones attracted to the trough. The concept of a carbon tax that offsets that cost and returns all proceeds to offset other taxes is attractive. Based on RGGI, however, be careful what you wish for. To their credit RGGI analyses have always been careful to not over-sell the actual emission reductions due to RGGI itself. When the Program Review notes that the lifetime effects of these RGGI investments are projected to save 76.1 million MMBtu of fossil fuel energy and 20.6 million MWh of electricity they are basing those numbers on the displacement of energy and emissions due to their energy efficiency, clean and renewable energy and GHG abatement programs. As noted earlier these numbers will be addressed in a later post. Finally let’s consider the ultimate goal of the program – GHG reductions. The Program Review Summary claims their investments have avoided the release of approximately 15.4 million short tons of carbon pollution. However, note that they spent $1.37 billion to achieve those reductions so the cost per ton is $88.67. Given that the EPA social cost of carbon is $36 per ton these reductions are not cost effective by that measure. However one thing is missing in all of the analyses and reports to date. The ultimate purpose of the program is to lower global warming but nothing has ever been published quantifying what these reductions will do in that regard. A back of the envelope calculation shows why. A recently published paper estimates that the Federal Clean Power Plan will reduce global temperature rise by 0.013 degrees Centigrade. The Clean Power Plan is supposed to reduce CO2 emissions by 870 million tons. The carbon reductions attributable to RGGI are 15.4 million tons and simply pro-rating the published projection of global temperature rise with the RGGI emissions yields 0.00023 degrees Centigrade. In my opinion because we cannot possibly measure that small a change in temperature the global warming benefit of this program is nil. I will give RGGI credit for developing the infrastructure to conduct a cap and auction program. They have an auction system that has conducted numerous sales without a hitch, there is a CO2 tracking program and the compliance methodology works. In addition the investments in energy efficiency and direct bill assistance are social benefits with no regrets. As a result I believe that RGGI is only a qualified limited success and no where near as successful as it its adherents claim. Author rogercaiazzaPosted on February 18, 2017 April 30, 2017 Categories Regional Greenhouse Gas InitiativeLeave a comment on Has the Regional Greenhouse Gas Initiative Been Successful?